I recently seen a at Cambridge station advertising cheap weekend returns to London so I thought I’d check the fare splitting via the longer route. This is looking at the super off-peak day returns or nearest equivalent. On the direct Ipswich to London Liverpool Street ticket there is only an off peak return valid for a month at £42.20 or the off peak travelcard for a single day at £47.50. The most common split is at Manningtree as some trains don’t stop at Colchester. However this involves a much longer journey time. Ipswich – Cambridge is around 1 hour 20 minutes. There’s one train per hour. Cambridge to Liverpool Street on direct trains takes around 1 hour 26 minutes to 1 hour 38 minutes with 2 trains per hour. Due to the timings, and long layover in Cambridge, particularly towards Ipswich, the total through journey time is around 2 hours 50 minutes towards London and 3 to 4 hours towards Ipswich. In comparison the typical journey times on the direct route from Ipswich to London on trains stopping at either Manningtree or Colchester is around 1 hour 07 mins to 1 hour 23 minutes. Thus it’s very much faster on the more direct route for a tiny saving. 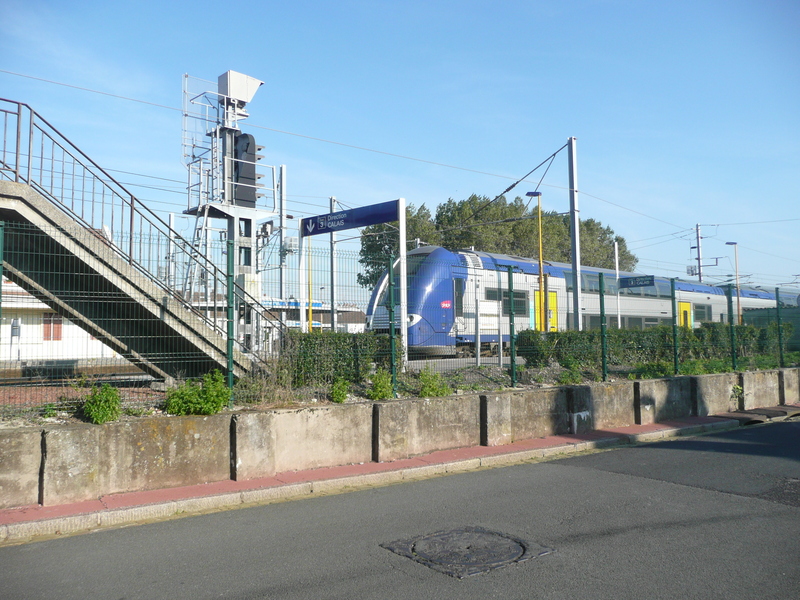 If planning far enough ahead advance fares would be cheaper than the above walk up fares. 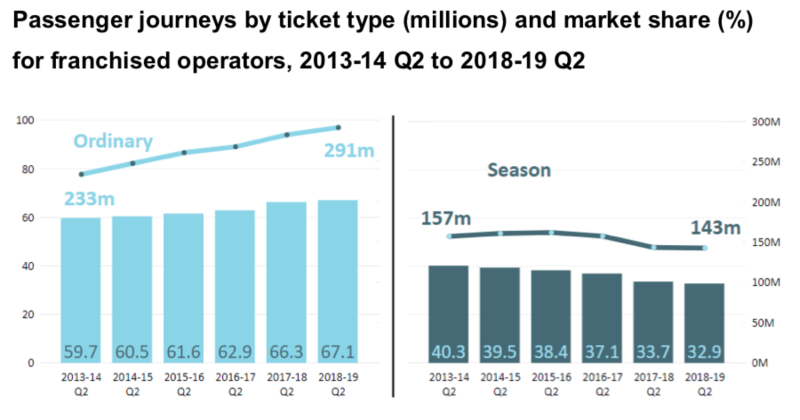 Hopefully the current UK rail fares review run by the Rail Delivery Group (RDG). This entry was posted in England, Ipswich, Transport and tagged Fares, Greater Anglia, Trains on September 14, 2018 by smsm1986. 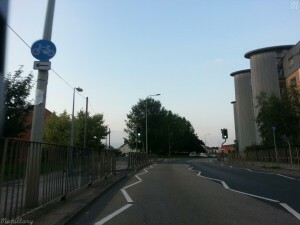 On 30th May 2015, I led a Cycle Infrastructure Tour around Ipswich. It was an excellent day where we had people from Cambridge, London, and Edinburgh, along with locals including Andrea McMillan who is writing the Cycling Supplementary Planning Document (SPD) for Ipswich Borough Council. There’s a route map shown at the bottom, and photos are clickable to either a larger version, or through to the Mapillary page so you have the location and nearby photos too. We started at Ipswich Railway Station and had a discussion regarding the future plans, including the change to the layout inside Ipswich Station, and some of the current issues, such as the cycle parking being tucked away around the back, and not sign posted, which should hopefully be improved as part of the station redevelopment. 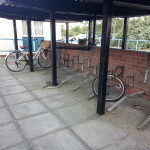 On departing the station, a couple of police officers noted that it was the first occasion that they had seen the Bike and Go bikes out in use. This isn’t surprising considering you can’t rock up at the station and hire a bike, instead you need to plan at least a week in advance to sign up online. There is no automated process at the station either, so you have to wait in the queue for a member of staff to get the key for you. On departing the station we crossed the road and headed along to the cycle path on the pavement, to the side of the Encore hotel. 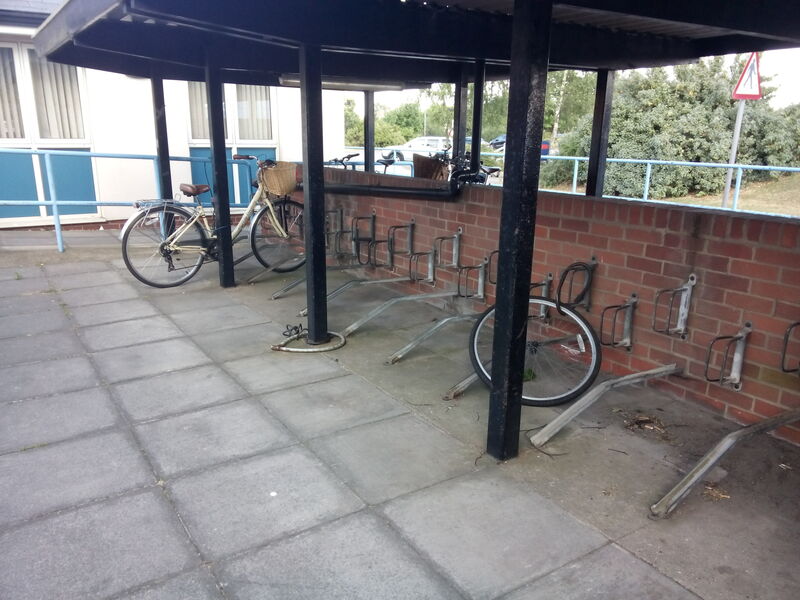 It was noted there is a lot of cycle parking, however it’s not sign posted, sheltered, nor in an optimal configuration as some of the stands wouldn’t be able to be used when there were bikes in some of the stands. It’s almost as though the developer was required to include some cycle parking for the site (which includes residential and shops), so placed in one corner, rather than spread around the site. 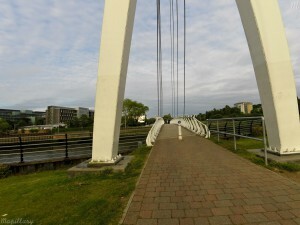 We then headed over the Sir Bobbie Robson Bridge, which is a cycle and pedestrian bridge which was put in as part of the developer to the south of the river. At times it can be a bit on the narrow side thus significantly slowing down cyclists. A wider bridge would reduce the level of cycle/pedestrian conflict. After the bridge we turned left to join NCN51 westbound. At the 2 large London Road junctions we had a short discussion highlighting that the junctions are designed for large amounts of motor vehicular traffic, with pedestrians and cyclists significantly inconvenienced by having to way 2 or 3 times to cross the road. On some of the lights it was difficult to see the red and green man when standing close to the signal due to the angle they were looked at. Due to the time that pedestrians have to wait they often cross in a gap in the traffic instead of waiting. On heading up London Road, the visitors from London noted that there were already bus stop bypasses in existence as you were cycling along the pavement legally. However few people recognise them as such. 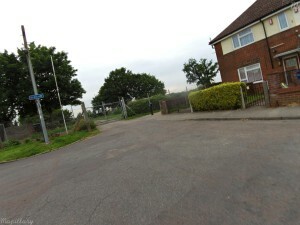 Just past the London Road allotments there is an pedestrian access route into the residential areas, however there are some significant barriers in the way, which make it difficult to use. 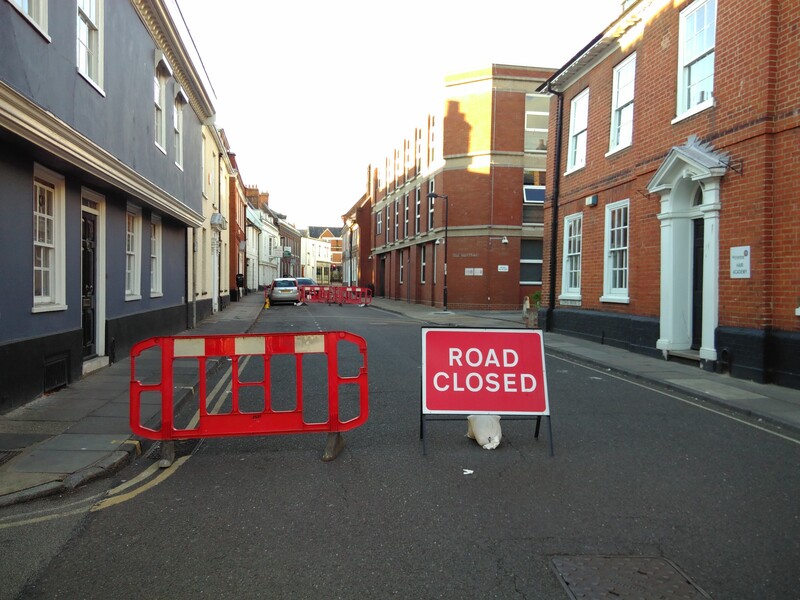 Enabling this for cycle use and sign posting the route would mean that people have a mostly traffic free route from Chantry via London Road and NCN51 into Ipswich town centre. At the junction of London Road and Robin Drive there was a discussion regarding the double dog leg crossing which makes it difficult for pedestrians and cyclists to cross as they have to wait 3 times to cross London Road. Also if you are on a bike with a long wheelbase or have a trailer, extreme care is required to get the corners right for the dog legs. The parallel residential part of London Road is generally nice to cycle along due to the low levels of motor traffic, and the hedge between you and the main road. This separation is a common design element that is used in The Netherlands. However the road could do with being resurfaced as it’s getting uneven, so can be tough to cycle on. 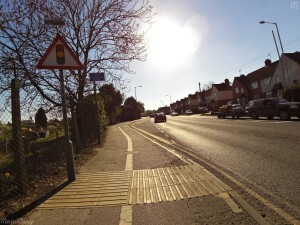 At the next junction it was noted that the cycle path (on the pavement) that leads from Suffolk One just stops at the traffic lights, rather than there being a toucan crossing to allow people to cross the road safely. 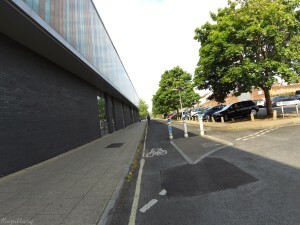 There is a significant issue where the students at Suffolk One drive there and there is no car parking for students. This was a deliberate decision to discourage driving, however due to the distances that students need to travel and little alternative transport, they just park in the local to the annoyance of the neighbours. Small things like a missing toucan crossing at the end of a cycle path contribute towards people not walking and cycling. 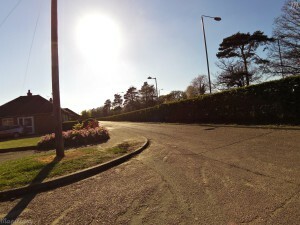 Cycling along Scrivener Drive, Shepherd Drive, and the start of Hawthorn Drive was rather intimidating due to the narrow road width and heavy traffic, particularly coming from the A12 and A14. Something needs to be done to make friendlier alternative routes in the area for people on bikes. 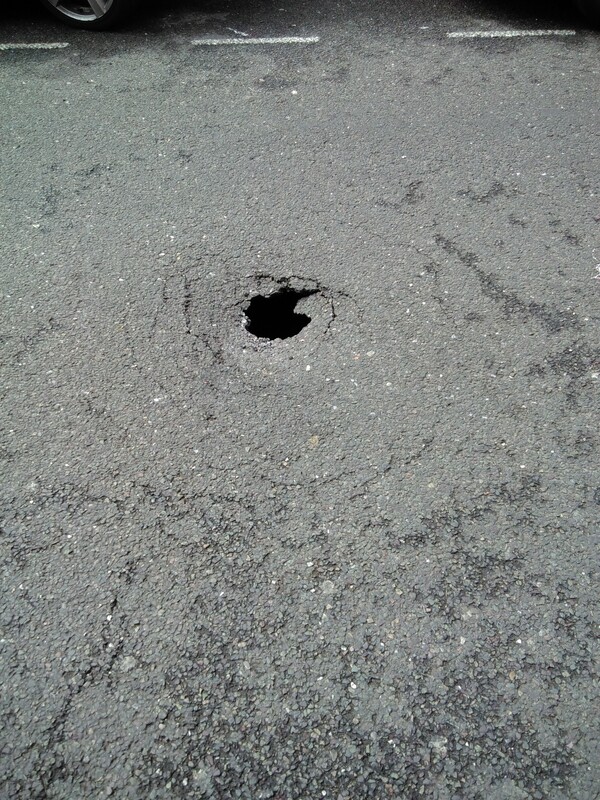 The rest of Hawthorn Drive has a significant issue which is resolvable with minimal impact on motor traffic. The road is wide with a houses on both sides, and occasionally shops, amenities, etc, with grass verges which are often parked on, even so there is space in most front gardens. There is also a problem of traffic islands, where drivers will try to squeeze past you. It’s a rather intimidating experience, especially if you are not able to cycle fast. It would be possible to remodel the road such that there is the pavement, separate cycle path, parking, traffic lanes, parking, separate cycle path, and finally the pavement on the other side of the road. There would be some points where there would only be cycle parking on one side of the road only, or not at all near junctions. This design would be typical of a Dutch distributer road, and would mean that the local school children have a safe route to walk and cycle to school. There are many schools within a small area, so this would be a big impact, especially with the current significant complaints about the school run problem. At the Hawthorn Drive/Mallard Way roundabout we had a discussion regarding the roundabout, as it’s significantly larger than many other busier roundabouts in the town, yet has very low traffic volumes, and has very wide corners so drivers can go round it with only small reduction of speed, and could easily injure a pedestrian or cyclist. Someone pointed out that the roads were probably originally designed so that the grass verges could be changed into an additional car lane instead at a later stage. 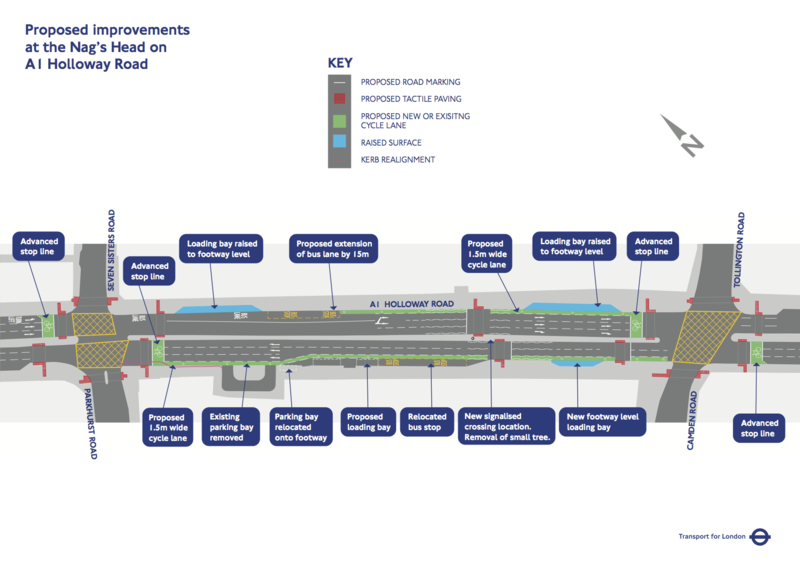 Mallard Way could get a similar treatment to the suggestion for Hawthorn Drive. We then heading along Stone Lodge Lane West, Birkfield Drive (which has the space for similar treat meant to Hawthorn Drive and Birkfield Drive), and into Carolbrook Road, where we followed a cycle path through Ellenbrook Open Space to reach National cycle network route 1 to head back into town. This section of NCN 1 is off road, and one of the better sections through Ipswich, however it’s very short before you are back on the road again. Heading along NCN1 on Stoke Park Drive can be rather scary, and isn’t somewhere I would be keen on taking young children due to the cycle lanes stopping for traffic islands where motor vehicle drivers regularly try to squeeze past you. I’ve seen occasions where car drivers accelerate past on the other side of the road on the wrong side of the island, or cut in just before the island. The cycle lane is less than the 1.5 metres wide, and it’s hard to fit a bike in never mind including some passing distance. 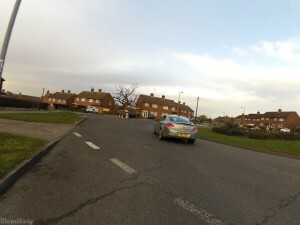 Towards the end there is a right turn into Bourne Park, which wouldn’t be easy for less experienced cyclists. The cycle path through Bourne Park is pretty rough gravel, and is tough going for adults, and extremely difficult for young children to learn to ride a bike. If there was a smooth surface through the park, and around it to make a circuit, there would be an ideal environment for children to learn to ride a bicycle, and play in the park. This is something that is really needed in this part of town, as there are few places which are safe traffic free environments for children to learn. On heading out of Bourne Park the NCN route swings north just to run parallel to the rail line along a narrow path which is overgrown with vegetation, and sometimes has flytipping at the north end. It’s not a pretty sight considering it’s the flagship national cycle route 1, and non standard bikes would struggle to get along the route. To save us going up and down a hill, and to also see another bit of cycle infrastructure, we headed off the NCN1 temporarily and headed along Wherstead Road. 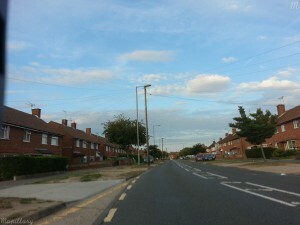 This is one of the main routes into town from the south, and connects with the A14. 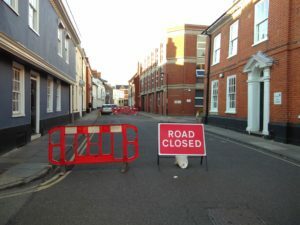 The road starts wide and gets narrower, particularly at the point where it goes under a rail bridge (for goods trains to get into the Port of Ipswich). 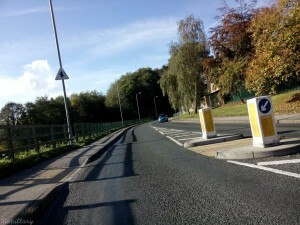 Shortly after the rail bridge, there is a cycle access off on to the quieter residential streets and a toucan crossing. The cycle slip road requires you to come off the road at an angle which means that you either have to slow down and/or swing out in the middle of the road. Alternatively you can follow the route many in the group choose and head on to the pavement early which was a more natural route to follow. 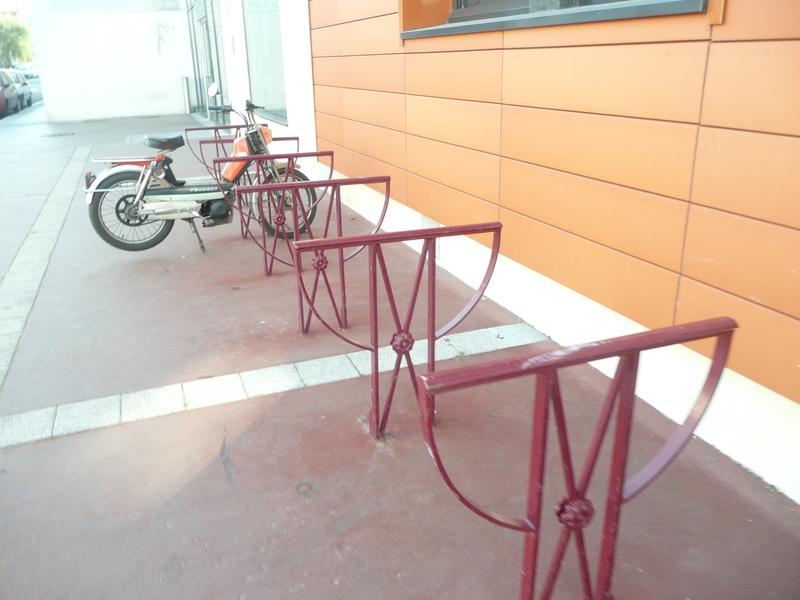 It would be a fairly cheap change to remove the railing and increase the dropped kerb, which would make it safer. The point where the cycle path joins the road is rather tight and there would be problems for people with cargo bikes or trailers. Onwards we rejoined NCN1 again briefly and headed quickly to The Brewery Tap via the waterfront as we were running a little behind schedule at this point. The waterfront has some traffic free sections, and has some heavy pedestrian use. This makes is problematic at weekends and in the evenings when there are heavy pedestrian flows. I have come across a regular local cyclist who didn’t realise that it is two way for cyclists, whilst only one way for motor vehicles. 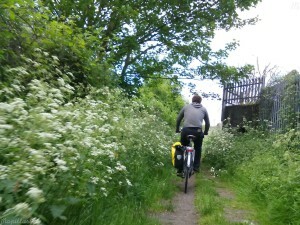 After lunch we headed up Cliff Lane and followed National Cycle Route 51 out to Ravenswood. At the junction of Cliff Lane and the entrance to Holywells Park we stopped for a chat. 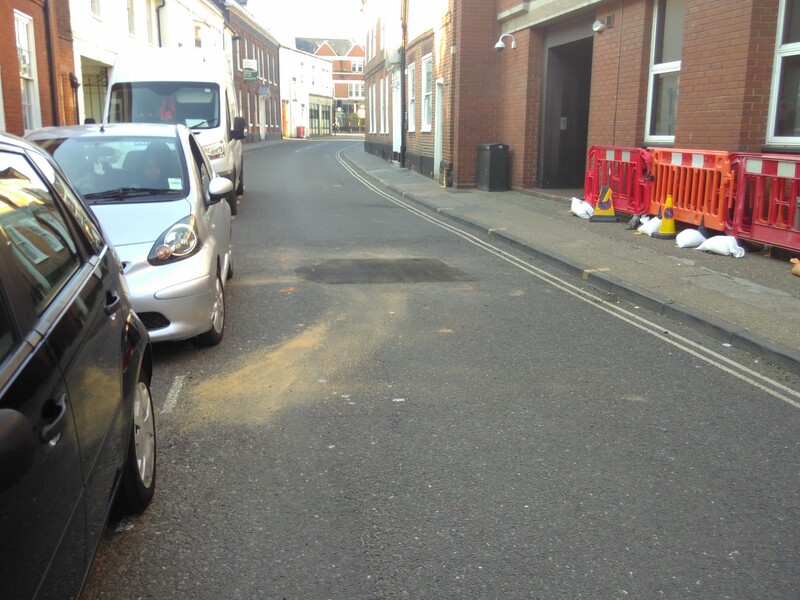 There’s a significant school run problem in the area (which has been on BBC Radio Suffolk in the past). There is also a similar issue with people driving to visit the park often with children. During the cycle along NCN51 to Ravenswood, the Londoners on the ride noted how quiet the residential streets were. 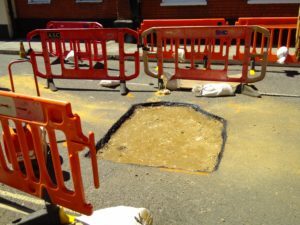 This is in part due to the route being filtered, and the residential roads being the furthest possible from the main access routes to the residential area. 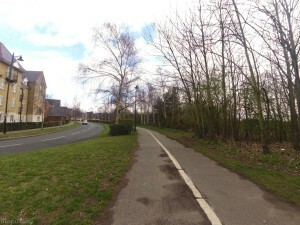 It is a much longer route, and many locals will choose shorter routes, such as Clapgate Land and Nacton Road instead, especially into town downhill, as it’s much faster and more direct. The NCN51 route is quieter, safer, and sign posted. At the point the Morland Road joins to the cycle path through to Raeburn Road there is currently a confusing NCN51 sign for people coming from the east, which suggests the route is into town only. Either that sign should be taken down, or it should be updated to show the route goes in both directions. 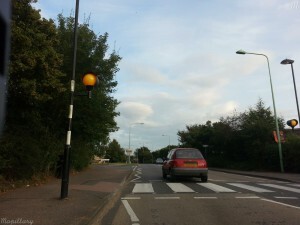 Turning right takes you into town, and left towards Ravenswood and Felixstowe. Ravenswood is a fairly new build housing estate, built on the old Ipswich Airport (final flight January 1998). 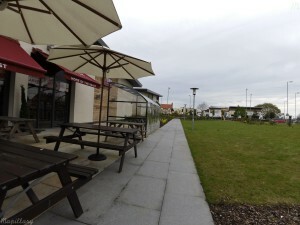 The estate was designed to be environmentally friendly with many cycle and foot paths, limited car space, traffic calming measures and a frequent bus link into the town centre. Through Ravenswood the NCN51 cycle path is very good if you are passing through the area, as there is minimal interaction with motor vehicles. However if you are trying to get from the main cycle paths on to the residential streets, it is very difficult to do so, and the cycle paths are around half the width they need to be. Often you have to cycle on the road where drivers can be rather intimidating. Ravenswood has one of the highest cycle to school rates in the county. On the edge of the Ravenswood estate there have been 4 new major chain restaurants built in the past year. 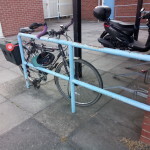 Sheltered cycle parking has been provided, however little consideration has been given to how you get from the cycle paths of the car park to the cycle parking. 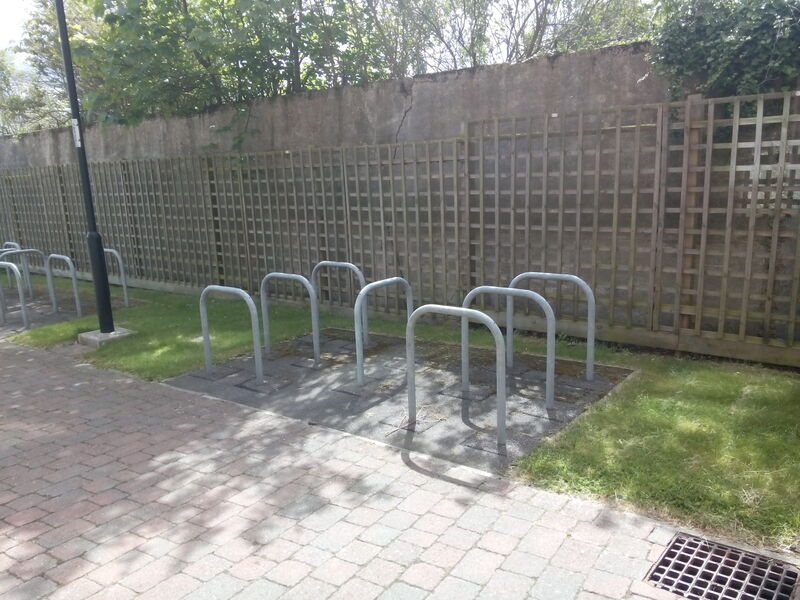 It’s as though it’s been stuck in some unused corner as a requirement of the planning permission, rather than properly planning the cycle parking in so that it is easy to get to. 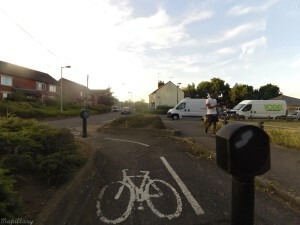 The staggered toucan crossing on Ravenswood Avenue by The Thrasher roundabout is quite tough to use on a bike, especially if you are in a group of people on bikes, have a trailer on the bike, or a cargo bike, the crossing becomes very difficult. Some of the tight corners at junctions within the estate are also very difficult with non-standard bikes. We then headed through Futura Park which is a new retail area built in November 2012. 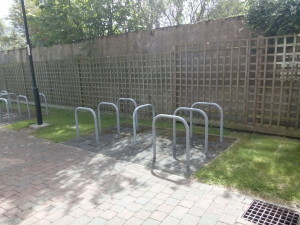 There were some additional racks added by Waitrose and John Lewis shortly after they opened as they were fully utilised in the first week of opening. 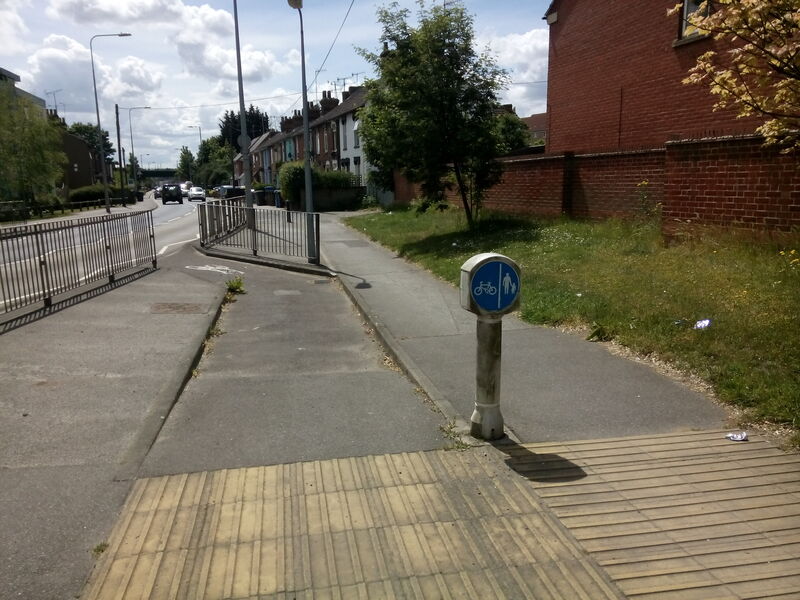 There is legalised pavement cycling for people to get to and from the shops, however once you get to the main road, Ransomes Way, the pavements get rather narrow. Also the plans for the junction outside the Sainsburys and Homebase will require people to plan ahead if they want to cross with the toucan crossing. Ransoms Way is also having the 2 lanes (1 each way) turned into 3 lanes (2 towards roundabouts, and one leaving roundabouts). I’d rather a cycle track or possibly a wider pavement to be implemented instead to reduce the conflict with pedestrians, and encourage more people to cycle to the shops. Heading along Felixstowe Road back into town, cyclists start on the pavement, and around the borough boundary cyclists are taken on to the road in a cycle lane with heavy and fast (40 mph speed limit) traffic and no protection between cyclists and the motor vehicles. Just after the roundabout we stopped on Bixley Road for a quick discussion. I have seen families walking their bikes around the roundabout and then getting back on to cycle on the pavement afterwards. 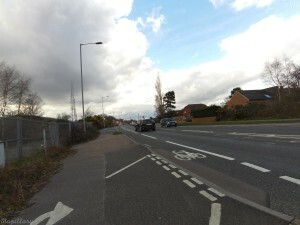 This roundabout is a stumbling point for encouraging more people to cycling due to the crucial link it provides with various parts of the town, including being on the main ring road route of the town. Due to the heavy motor traffic on Bixley Road, I chose a route that took us on to quieter back roads pretty quickly along Princethorpe Road, Temple Road, Chilton Road, Foxhole Road, and Heath Lane where you get to a cycle path, which is a back entrance to Copleston High School, and the end of the back access road to the hospital. 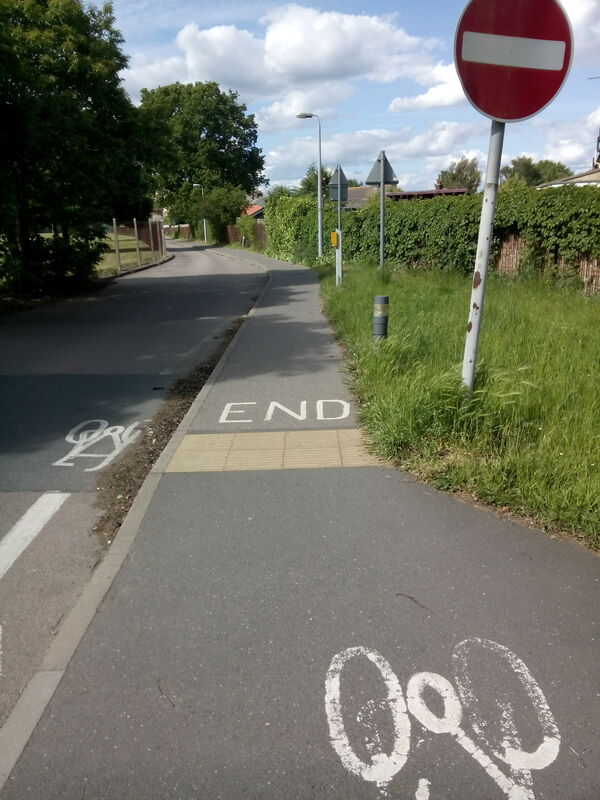 However it looks from the signage that you can’t cycle in this direction to get to the hospital, even so it would be a useful link to the hospital avoiding the main roads. We stopped within the hospital grounds on NCN1 to discuss the hospital cycle access. 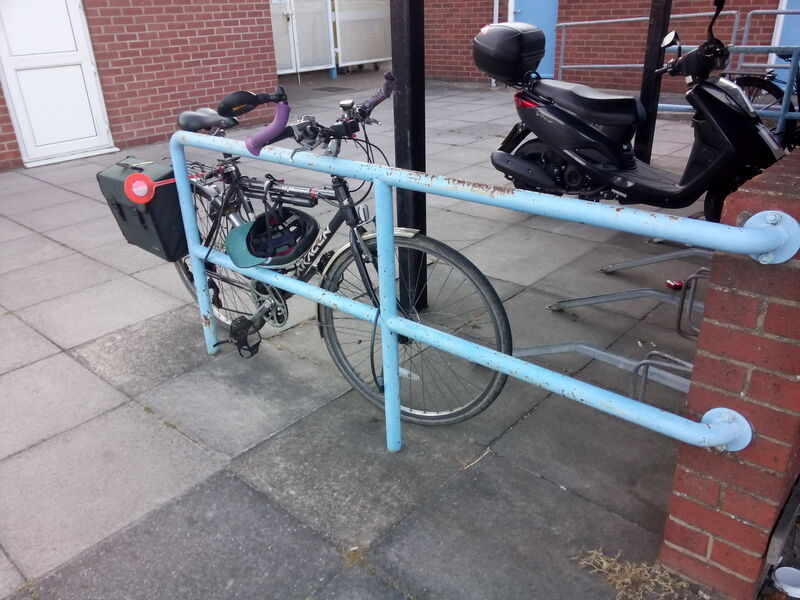 The main A&E has some good quality sheltered cycle parking, however cyclists are expected to share the road with motor vehicles. 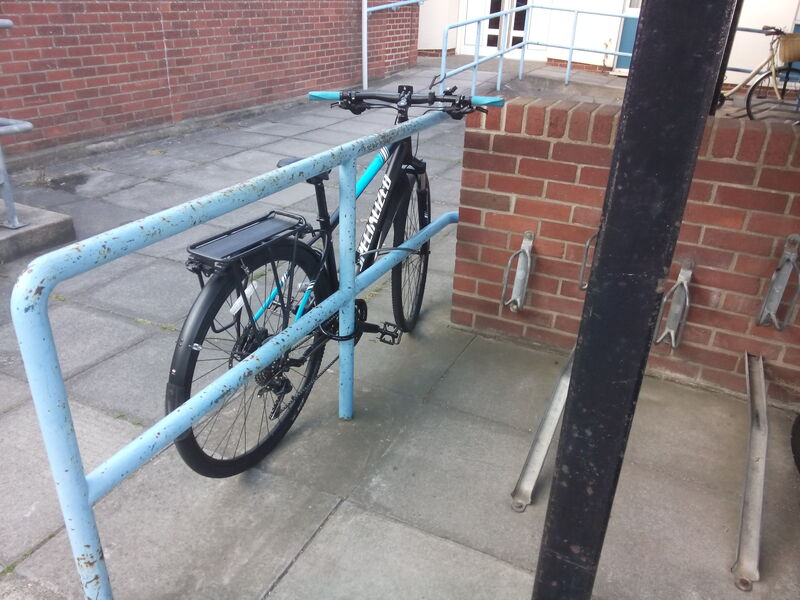 Other departments have large cycle parks near their entrances, however it’s generally of the wheel bender designs, so people will try to lock their bike in a similar manner to a Sheffield stand, such that the bike is supported. Some of the cycle parking could be better sign posted for example similar to a bus stop flag post to encourage usage, and so that people can see the cycle parking from a distance. The north cycle path on to Woodbridge Road doesn’t connect with other cycle routes well, nor gives a nice transition back on to the road. From the hospital we followed National Cycle route 1 back into town, on the way we stopped off on Rope Walk, which is seen to be one of the best cycling facilities in the town as through motor traffic stopped on this section of road, and it means there is a safe reasonably quiet route from here into town. Just beforehand, Kings Avenue and Milner Street are a significant rat run in the morning peak, and need to have the rat run closed to through traffic to make the route more pleasant and also reduce motor vehicle congestion since drivers on St Helens Street are letting drivers out which then reduces the flow of vehicles from entering the traffic lights at the bottom of Grove Lane, Spring Road, and Warwick Road. At the junction of Rope Walk, Waterworks Street and Bond Street, there is an interesting arrangement whereby cyclists just have to give way to traffic from the left and don’t need to wait for the green light. It can be a bit narrow to get through if you are on a wide cargo bike or have a bike trailer. We headed through the town centre which was quite quiet with it being the end of the day. We stopped off in Arlingtons Cafe to have a final discussion and review of the day. The was a lot to look at, and several other places I’d have liked to have gone to discuss too. I’m planning to run some more rides at a slower pace so that there can be more discussion at the stops. 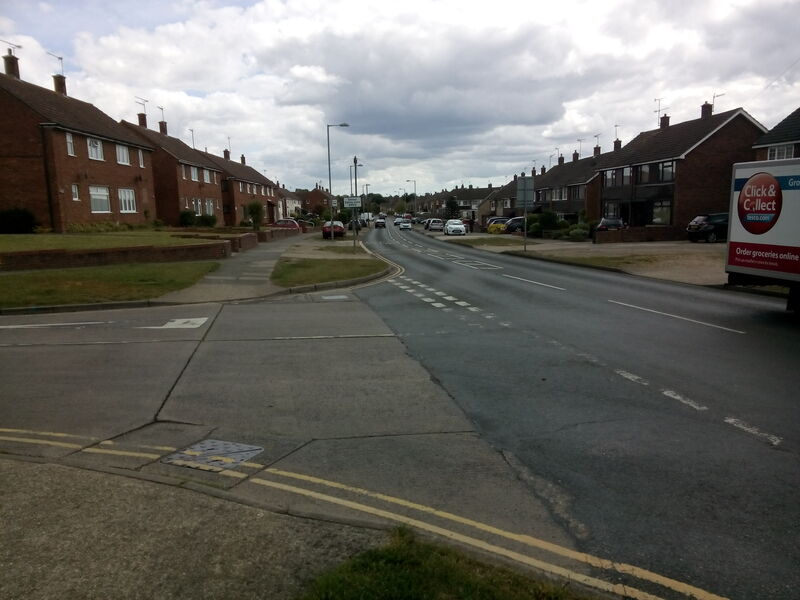 This entry was posted in Cycling, Ipswich, Transport on July 5, 2015 by smsm1986. 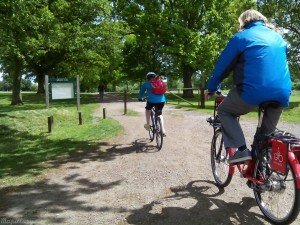 Last Sunday I went on the Barnet Great Divide Ride in North London. The roads up there do seem to be scarier than what I’m used to for London. As an experienced cyclist, I was glad that I was in the middle of a big group of 80 people on bicycles and not cycling through some of those junctions on my own. The lack of patience in London’s driver’s never ceases to amaze me. For example there were a few drivers, who through their impatience were causing more of a traffic jam, whilst had they just paused for a moment to let someone else out, everyone would be further on in their journey. Or a driver who thought that he would be able to hit the accelerator and make us suddenly stop as we were crossing a junction, rather than waiting for less than two minutes for us to all pass. By being impatient he caused himself to have even more of a delay, due to where he ended up stopping in the middle of the road in front of us. Barring a few minor issues, it was really nice ride. There were some drivers who where nice and held the traffic for use to get out at junctions, which deeply contrasts to some of the other impatient motorists. At the end of the ride we had a picnic in the park in the middle of the last junction. It could do with better pedestrian and cycle access, some trees and benches, and it’d be a much nice place. 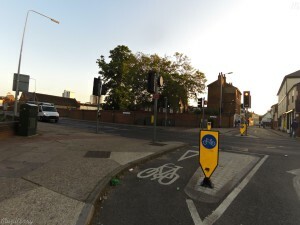 Charlie the ride leader wrote a succinct blog post showing how on the way back to South London after the ride, when we tried to use the cycle infrastructure on one of the junctions, that we cyclists needed to jump up on a wall to let some pedestrians past. Is it any wonder cyclists don’t use it? Is it any wonder that cyclists get killed when they take to the roads instead with the traffic moving so fast? My photos from the ride. 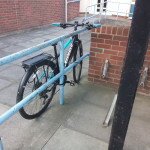 This entry was posted in Cycling, London, Transport on March 30, 2012 by smsm1986. 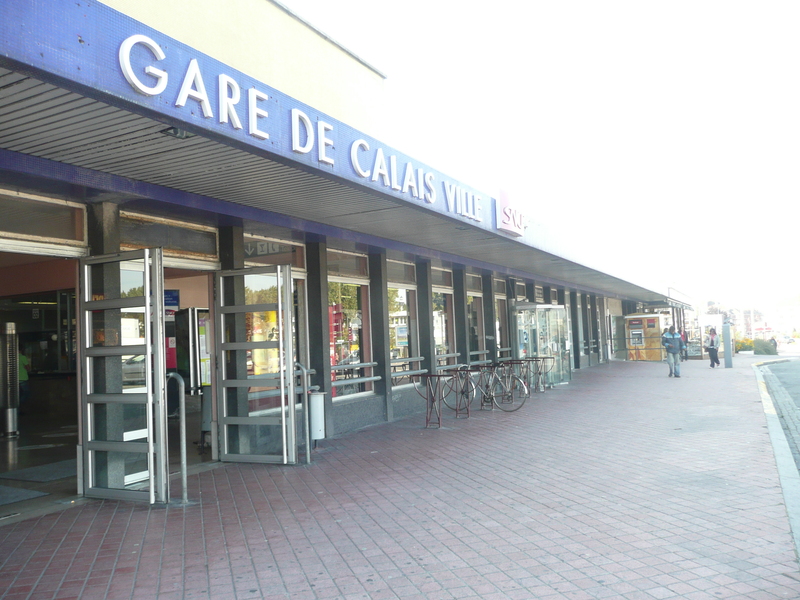 On Saturday I took a random day trip to Calais on the train and ferry. 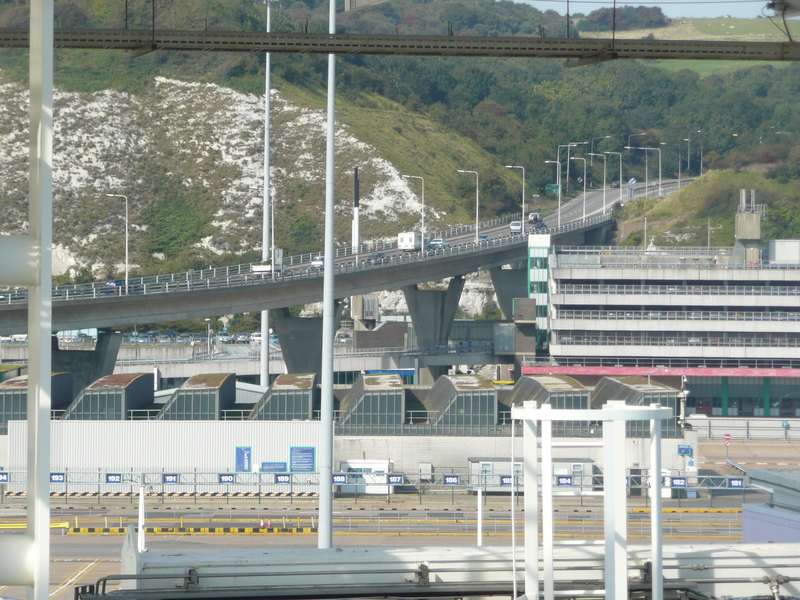 It’s been eleven years since I last travelled on the Dover to Calais ferries. This time I was on foot instead of being in a car. I learnt quite a few things that I should do differently the next time. Aim for an earlier return ferry, so that I don’t have to take the 2304 from Dover to Faversham to change at 23:42 to arrive in London Victoria at 01:29, and then have to take a night bus home. (The stop before London Victoria on the last train is Dartford). 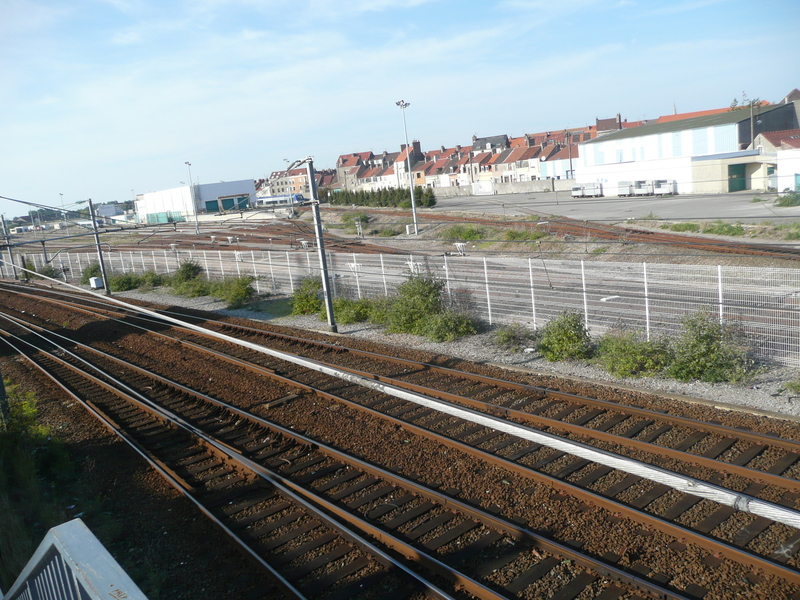 I did have a nice wander around Calais, and you will be able to see the trail of destruction next week when the data is rendered on the main map. So far it seems that someone has traced the railways from landsat, which isn’t particularly accurate. 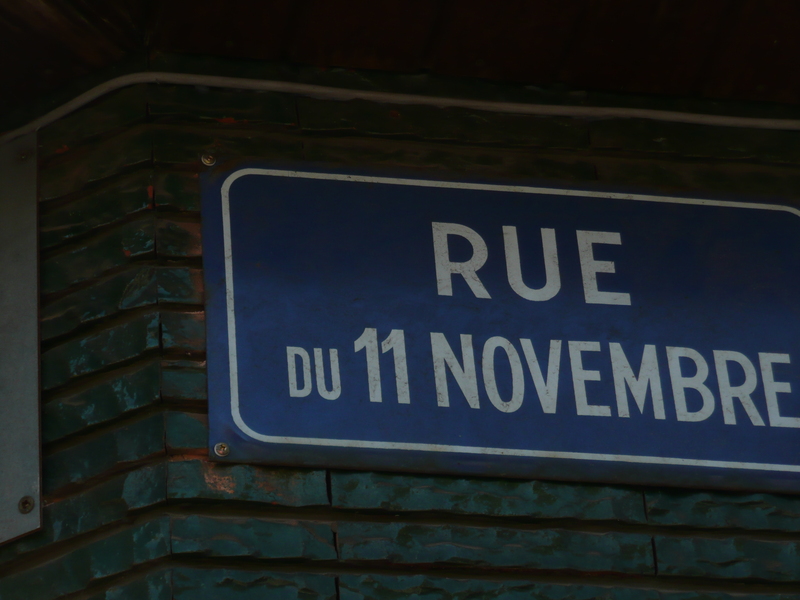 This entry was posted in OpenStreetMap, Transport, travel on September 24, 2008 by smsm1986. For the next five months Shandwick Place in the west of the centre of Edinburgh is closed for work to move the utilities for when the trams are going to be introduced in a few years time. The council, TIE and Lothian Buses were quick enough to produce alternative routes for cars and buses, however their alternative route wasn’t suitable for cyclists. 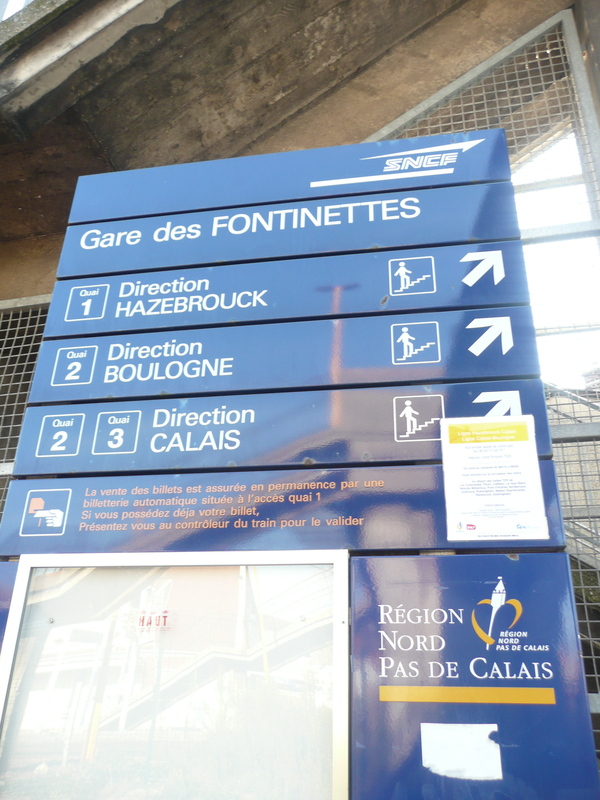 On Friday they provided some written instructions without any maps, which they had done for the car drivers and bus routes. 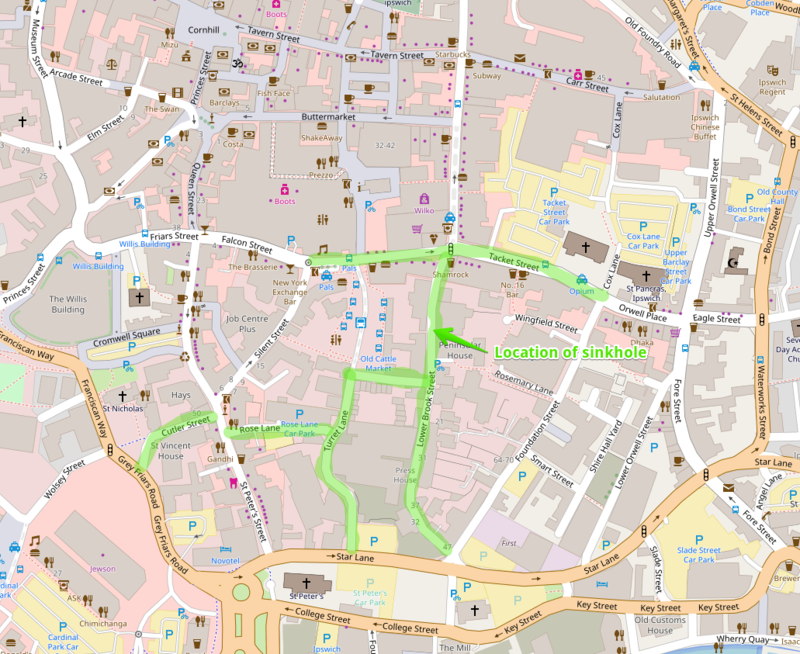 See below for a map with the council’s route drawn on top of Andy Allan’s rendering of the OpenStreetMap cycle data. 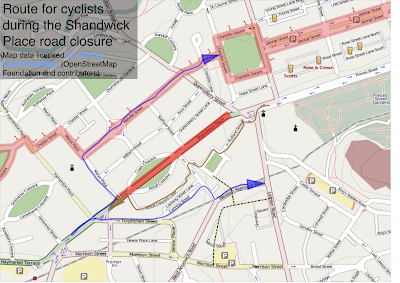 This entry was posted in Council, Cycling, Edinburgh, OpenStreetMap, Trams, Transport on March 3, 2008 by smsm1986.